Leanne joined TAP in 2003 and since then has created case studies and CEO referenceable outcomes with numerous organisations including Dun & Bradstreet, Microsoft, Beiersdorf, MediaCom, Laserlite, Leo Burnett, MasterCard, Maxxium, Westpac, Bonds, Asteron, Getronics, Hanes, Rabobank, Fosters, Foxtel, ANZ and Pacific Brands. 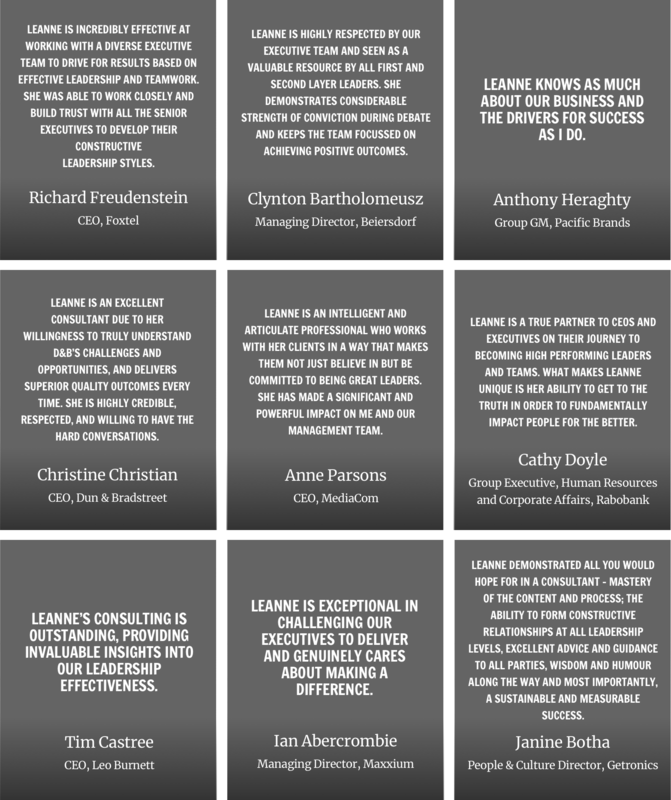 Leanne’s extensive consulting experience spans leadership and organisational transformation, strategy development and execution, as well as the alignment of internal business practices and processes to organisational goals. She is also a skilled executive coach, meaningfully combining 1-1 relationships with organisational interventions to create results at a personal, as well as an organisational level. Prior to arriving in Australia, Leanne consulted at Standard Corporate and Merchant Bank, one of South Africa’s largest Merchant Banks. Before this, Leanne worked at Arthur Andersen consulting internally as an Organisational Psychologist. Throughout her career, Leanne has focused on optimising individual and organisational potential and enabling achievement beyond expectations. Leanne has a Bachelor of Arts in psychology and communications; a first-class honours degree in Organisational Psychology as well as a Master’s degree with distinction. Leanne is a registered psychologist in Australia and South Africa. Leanne’s deep interest in human and organisational behaviour encourages a deep exploration of current literature and theory. Her knowledge and insight gained through this research has resulted in the development of multiple new techniques and approaches to transformation, as well as significant intellectual property development. Leanne has numerous accreditations, she is a master practitioner of Human Synergistics tools, and is a member of the Australian Institute of Management.